Nord User Forum - View topic - Does the Hammer Action keybed respond fast enough? Does the Hammer Action keybed respond fast enough? Will a hammer action keybed respond fast enough to playing repeated staccato string chord sounds or fast repeated brass sound chords? Think of eight 16th note, 3 note chords repeated at a bright tempo. and less responding would the hammer action of Stage 2 EX HP76 be? Enough to rule it out in this particular situation? I'm just going to mention that I'm asking because there are no dealers anywhere within 100 miles of me to go and try them out in person, where I'd find out for myself. Last edited by maestrosteve on 09 Jan 2017, 02:51, edited 1 time in total. Re: Does the Hammer Action keybed respond fast enough? Well I tried a HA 88 in the store and didn't like it for any organ stuff. I ended up buying a Compact Semi weighted and I love it. I think it is really a matter of personal preference. Now you know what mine is. +1 ... very, very personal! Last edited by Marlowes on 09 Jan 2017, 09:49, edited 1 time in total. I appreciate the responses. I clearly know that it's a personal thing whether you prefer semi-weighted or hammer action. There are tons of posts where people ask about what they should get. I didn't. Everybody's playing and preference is different. I asked under a certain circumstance about how fast the keybed would respond, since I have not been able to try either one. The answer to that is more likely to help me make up my mind as to which to get. If you went over to your hammer action keybed and played a 3 note chord very fast 8 times in succession, will it come out clean and does the keyboard respond fast enough? That's what I need to do, and if the hammer action can't handle it, then the answer for me is the semi-weighted. I'm OK with whatever will handle the task. I already know that fully weighted keybeds can't handle it the way I'd like. Too sluggish. The hammer action keybed is said to be a lightweight action, somewhere in between fully weighted and semi-weighted. I would be the best judge for me on what would work here, but I'm in no position to find a keyboard to try, and would prefer to not buy something to try only to be unhappy and return it. Everybody in these forums has a Nord keyboard and knows what it can and can't do. I don't. I'm looking for some help. It is greatly appreciated. Thank you. So I would choose either the fully weighted HA or the waterfall and combine it with an extra (MIDI) board with the opposite action. I bought a HA88 and I trigger the organs/synths with an old Roland D-10 (bought for € 60). With the stage you can trigger complete instruments per part with an external board. For example, in my setup Organ A and Synth A is triggered by the Roland (when selected). IMO very flexible and no action compromise. To answer your question: IMO the HA keybed is quite light and can be played relatively fast. But it's not perfect for some synths and organs. Glissando's are terrible. Last edited by GeeDeWee on 09 Jan 2017, 11:22, edited 1 time in total. I use a specific keyboard for a specific purpose. What I asked about playing the 3 note chords fast, I accomplish that easily on my synth weighted Kurzweils, not so easily on the weighted ones. I'm more of a piano/synth player than an organ player, and while I think the few Nord organ sounds I've heard are really fantastic, they wouldn't get much use from me. At least that's how I feel right now, always subject to change, so while I'll consider a keybed for doing possible organ glisses, I'm not really too likely to do it or care about it. Can I play very legato fast string lines, and staccato brass? That's what I care about. I can play piano on any of the actions, even though my personal preference is a heavier action. I do that with my different keybed Kurzweils. For me, every keyboard is a compromise, either in features, weight or sounds. I prefer to not compromise on reliability. I think there's some confusion over a few points, I'll try to help as much as I can. maestrosteve wrote: If you went over to your hammer action keybed and played a 3 note chord very fast 8 times in succession, will it come out clean and does the keyboard respond fast enough? maestrosteve wrote: I already know that fully weighted keybeds can't handle it the way I'd like. Too sluggish. 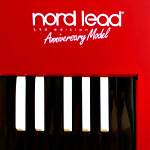 What Nord calls a "hammer action" (HA) is a fully weighted keybed, specifically FATAR's top-of-the-line TP-40 action. The "lightweight" action is the so-called Hammer Portable found on the HP models (Stage2 EX 76 and Electros). It is another fully weighted action, FATAR's TP-100, which makes some compromises to save as much weight as possible, but still retaining a weighted piano feel. Actually, many find it even heavier to play than the HA. The "lightweight" only refers to the physical weight of the keyboard. Having clarified that, my 2 cents of advice. 1st cent: for fast playing (piano or otherwise) the HA (TP-40) action is better then the HP (TP-100). 2nd cent: if you care so much about strings and brasses and you already own several Kurzweils, why are you considering a Nord? Nord's strengths are pianos, organ and synth. The samples, although very useful, are not the best around (single-layer, not able to support timbre changes with dynamics). On the other hand, Kurzweil is especially renowned for the quality of its brass, strings and orchestral samples, and it uses the same actions as Nord (TP-40 and TP-100). So compared to your boards, the choice of available keybeds is not a factor (they are exactly the same), and the samples you already own are probably better. You risk spending a lot of money for a keyboard that is no better of the ones you already have, at least in the specific area you're interested in. Spider, thanks for the reply. I'm going to take your questions 1 by 1. I did say playing fast 3 note chords, but if you think it's too generic, then I'd say quarter note = 108 bpm. Eight 3 note chords played in 2 beats as 16th notes. Why am I considering a Nord? A few reasons. In my earlier Kurzweils, I could load specific samples that I love to play. I can't do that with the newer Kurzweil keyboards I own now. Either they don't accept sample data, or the samples no longer sound the same. I can replace every sound in the Nord with a sample if I choose, and I probably will. I recently sold a 76 note Kurzweil because it was way over 40lbs, and I can get a 20-25lb Nord to replace it. I have to carry it, I'm not getting any younger. Even my 61 note Kurzweils are about 30lbs. A 10 pound difference if I get a Stage 2EX compact, plus I get an extra octave. As far as synth sounds and the sounds that I like to play, you may be right, the Nord may be no better for my gigs than my Kurzweils, and not a necessity for me to own. I like to get re-motivated every few years with a new gigging keyboard. I've toured, had keyboards rented for me in every town, I've played lots of different keyboards in gig situations. I've owned Rolands, Yamahas and Kurzweils keyboards. I happen to prefer the Kurzweils. I've never even tried a Nord. Risk spending a lot of money? Well, I work a lot, make the money, like to spend it on nice quality things but I don't like to throw it away. I think there might be many positives for me owning a Nord, and I need another 70+ note keyboard at this time since I sold my heavier 76 note Kurzweil. No risk really. If I use it for 6 months and don't like it, I can sell it. I'd prefer to love it, which is why I'm asking specific questions here in the forums before I own it. I appreciate you chiming in. "not able to support timbre changes with dynamics"